We're in the time of the Korean War, when the balance of power in the Pacific was very much up in the air and a lot of ruins from World War 2 still lie about for any enterprising individuals. When Robo runs into trouble flying a new prototype, he encounters some of these scavengers and finds not all of them are friendly. It's a bad situation for Robo and his only saviors are a group of women with an agenda of their own. 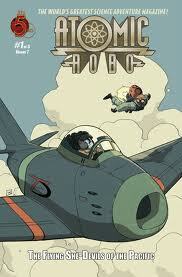 Science fiction mixes with witty banter and a few doses of historical fact in a new Atomic Robo mini-series. The idea of having scavengers making science fiction items from World War 2 scrap is brilliant. Even better is the natural feel that Clevenger gives this concept. Robo, full of typical American male feelings, is shocked at the idea that girls are acting like modern-day pirates, with the ability to design machines that are the equal or better of Robo's own technicians. The women, on the other hand, refuse to accept their 1950s-era role as second-class citizens, putting away their skills and knowledge to tend to the home. They want to live life the way they choose, and so end up on an uncharted island together, risking their lives just to have what Robo and his male companions take for granted. It's absolutely ludicrous that Clevenger has faced charges of being sexist for creating this set-up. Robo's reaction makes perfect sense for the time period, and to make him totally cool with the idea of women doing male things wouldn't make sense at that time. Obviously, if he were this shocked in a story set in 2012, we'd have to have some words for Mr. Clevenger. As if that weren't enough, in a bit of exposition that's frankly a bit tedious (and must not have worked), Clevenger painstakingly hand-holds the history-challenged reader through the sexual politics of the time. That shouldn't have even been necessary, and it's even included as part of a meta-joke as the Captain of the She-Devils turns into Basil Exposition from Austin Powers for Robo (and the reader's) benefit. The dialogue, from "Better get used to it" to Robo's impressed opinion of the She-Devils, clearly indicates that Clevenger is on the side of the women and not the culture in which Robo himself has grown up. Listen, knee-jerk crusaders: You look like an idiot when you do this. Take the time to read first. This is like saying a book set in 1851 that featured a slave owner as a character means the book is automatically racist. When you do this--and you do this all the damned time--you make those of us who try to point out the problems in comics (and other culture) in real examples look bad. We lose our impact because you're crying wolf at the drop of a hat. Stop it, okay? Ahem. Getting back to the story. While Clevenger tries to give a history lesson, Scott Wegener turns in yet another amazing artistic outing. He deftly handles the air fight that opens the series by using a lot of tight panels, reaction shots, and perspective. Wegener's designs for the female characters make them distinctive and is in no way exploitative. (Just picture an all-female pilot cast in the hands of, say, Greg Horn. When you're done shuddering, c'mon back. I'll wait.) They have their own haircuts, clothing styles, and body language, showing that it took all kinds to make the war effort work. As with past Robo volumes, Wegener has his hands full designing new wonders for the world, and this one is no exception. The coloring is top-notch, using a varied palette to keep the machines, jet packs, secret lairs, and other backgrounds interesting. Wegener's look and feel is distinctive, and it keeps Robo looking sharp every time out. Using his witty style and good sense of fun and adventure, Brian Clevenger and Scott Wegener have once again come up with a story that fits their robotic protagonist perfectly. I can't wait to see how Robo squares his outdated ideals with the modern outlook of the women who are made outlaws by a society not ready to accept them and look forward to the next four issues. You can get issue one digitally now, and maybe in a comic shop, too. Issue two of the series is due out tomorrow, in comic shops and digital format. The nice thing about Robo is that you can start anywhere--now's the perfect time to jump in and fall in love with the bucket of bolts with a tongue of acid and more science than you can shake a stick at.